The line outside the Medicine Man dispensary in Denver on Jan. 1, 2014, the first day of legal recreational marijuana sales. 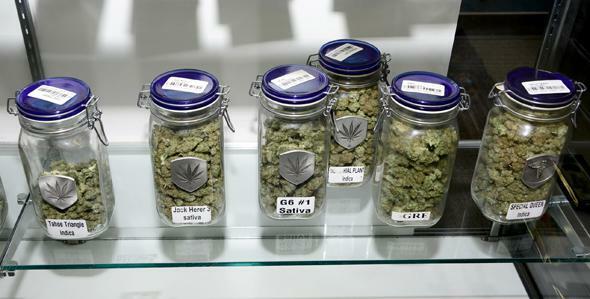 On Jan. 1, Colorado’s recreational marijuana shops opened for business. It was quite the party. As politicians and marijuana activists jockeyed for the attention of the horde of reporters on the scene, the world’s first legal pot shops opened for business. Most soon had lines stretching around the block. People had come from all over the country, all over the world, and they happily waited hours in the wintry morning chill just to set foot in a store. Everyone wanted to be part of history, and for that they were willing to pay a premium: Recreational pot prices, including hefty new state and local marijuana taxes that in Denver equal nearly a nearly 29 percent tax rate on all pot sales, are currently going for $50 to $60 an eighth, nearly double the price for medical pot in Colorado. When business ended that first day, the 37 pot shops open statewide had reportedly racked up $1 million in sales. It seems like a perfect situation for someone to make a lot of money. But is the legal weed market really as lucrative as it appears? The people most likely to benefit are those who have previously been selling licensed medical marijuana in Colorado, since for the first nine months of 2014, they’re the only businesses allowed to enter the recreational market. The arrangement makes sense; it allows state policymakers to build on an existing, stable regulatory system and allows them to work with operators who have proven their capacity to comply with Colorado’s strict marijuana regulations. But for medical marijuana dispensary owners, it amounts to a highly favorable state-sanctioned monopoly. With no new competition, product already in hand (dispensaries getting into the recreational market are allowed to use some or all of their medical crop for recreational sales), and the staggering demand created by marijuana still being illegal everywhere else, Colorado dispensary owners appear to be sitting on a gold mine. But that may not actually be the case. We took a look at the existing financial situation for Colorado dispensaries by convincing one of them to show us its books. “They all think we’re making money hand over fist,” says Brandon, the 29-year-old-proprietor of a midsize Denver operation, which has been in business since 2009. (We’re not revealing his real name or that of his dispensary; although he’s in compliance with state law, he didn’t want his competition knowing the ins and outs of his business.) In truth, business is going well for him. Located in a stylish downtown building filled with loft-like workspaces, his dispensary sees about 50 customers a day from its stable of 300 or so regular medical marijuana patients, and up to about 80 sales a day on Fridays and Saturdays. With each of his customers spending about $65 per visit, lately he’s been bringing in upward of $100,000 in revenue per month. In 2013, he brought in $1 million in sales for the first time, and he could stand to gain significantly from recreational pot sales. A “budtender” helps a customer at the Medicine Man dispensary in Denver on Jan. 1, 2014. But looking at Brandon’s books, it becomes clear that, so far at least, nearly all the money coming in the door is going right back out in expenses. Like many Colorado dispensary operators, he’s faced major, expensive problems with his grow facilities. He’s gone through five grow managers in four years, as top-notch growers who don’t already have lucrative, stable jobs are hard to come by. He’s had to destroy an entire poorly produced crop yield that had been devastated by mold, mildew, and pests. Brandon has also faced sky-high regulatory costs; between applying for his recreational marijuana sales license so he can sell retail pot this spring and upgrading his existing medical marijuana sales license to accommodate the growing number of patients registered with his dispensary, he estimates he’s been shelling out $15,000 to $20,000 over each of the past four months on city and state applications, licensing, inspection, and permit fees. There are other new costs associated with recreational sales, such as purchasing opaque, childproof shopping bags to accommodate the state’s new marijuana packaging rules. Brandon has also been hemorrhaging money in the form of legal and accounting fees to comply with an aggressive, multiyear federal audit of his business, one of the first of many Internal Revenue Service actions he predicts will soon be plaguing Colorado’s marijuana industry. “Everyone is going to be audited,” he says. After all, the more the IRS knows about the nascent marijuana industry, the better it can figure out how to tax it. Then, says Brandon, there are the business costs of operating in what remains a legal limbo. For example, he suspects his landlord is charging him a higher rent than the other businesses in his building and is making him shoulder a disproportionate share of building improvement costs, because of the taboo nature of his business. There’s another reason Brandon doesn’t seem to be making much money: the little-known tax-law wrinkle that creates enormous incentives for marijuana companies to sink as much revenue as possible back into their businesses. Under Section 280E of the Internal Revenue Code, those violating the Controlled Substances Act—whether they’re common street dealers or vertically integrated, state-regulated marijuana businesses—are required to pay taxes on the proceeds of all their transactions, but without the benefit of deducting most normal business expenses. Unlike other illegal businesses—prostitution, gambling, or even murder for hire—only drug dealers are singled out for this special tax treatment. (Whereas a hit man who gets busted and forced to pay taxes on his blood money can deduct the cost of his sniper rifle, travel expense to and from the crime scene, etc.) The only break marijuana businesses get under 280E is that they can deduct their cost of obtaining their illegal goods. The more a marijuana business can spend on growing its inventory (i.e., more marijuana), therefore, the more it can write off as the cost of goods, and the less it will have to pay in taxes. Anything Brandon had pocketed of the $1 million in revenue he made in 2013—or invested in, say, new retail space—would have been taxable. Instead, like many savvy marijuana entrepreneurs, he’s reinvesting his revenue in his grow operation, expanding and upgrading his 5,000-square-foot facility in advance of getting into the retail marijuana market. It’s a smart business move, but on top all his other business costs, it means Brandon’s business doesn’t look all that impressive on paper. Generally speaking, investors are interested in checking out a company’s gross profit margin, which is the ratio of its revenue minus cost of goods to its overall revenue. A high gross profit margin suggests the company could be highly profitable as it scales up its production. Over a six-month period, Brandon’s dispensary had an average gross profit margin of 32 percent. That’s not terrible—most grocery stores have gross profit margins around 20 percent—but it’s not great either, and not at all the financial bonanza many people make the legal marijuana business out to be. Starbucks, another company that deals in mind-altering, plant-based substances, regularly has gross profit margins of 57 percent, nearly twice that of Brandon’s dispensary. Marijuana for sale at the Medicine Man dispensary in Denver. Maybe that’s why Brandon, like the majority of Colorado dispensary owners, didn’t open his doors to the recreational market on Jan. 1, despite the head start he has over other potential marijuana entrepreneurs in the state. Only 136 of the 517 dispensaries currently operating in Colorado applied for a Colorado recreational sales license when it was first offered last fall. Brandon was among those who applied for a license, but like many others, he’s waiting a few months to see how the retail market pans out before making use of it. The cost of opening a legal marijuana shop is just too high, and the margins too thin, to jump in without careful planning. Besides, he’s able to sell all of the 50 or so pounds of marijuana he produces each month to his existing medical customers; if he didn’t have enough pot for them, those loyal customers might look elsewhere. Colorado’s medical marijuana market, in other words, isn’t going to be killed off by the recreational market anytime soon. In fact, when recreational marijuana shoppers notice the significantly cheaper shelf prices for those carrying a $15 Colorado medical marijuana card, they might consider making an appointment with their doctor. In this way, the opening of the legal market could lead to an increase, not a decrease, in the number of medical marijuana patients. In addition to lower prices, medical patients will be able to purchase more pot (2 ounces versus 1 ounce), pay lower taxes, and purchase at age 18 rather than 21. Next Up: Colorado’s new gold rush. A look at the pot realtors, pot testing facilities, pot insurance agents, and pot security companies all hoping to strike it rich in Colorado’s legal marijuana economy.